Hello to all the BIObus followers, we have some interesting things for everyone to read abut this week! We have been fortunate enough to spend over a week in the great light North, Kluane National Park. It is quite the experience here to be walking around at 12 am and it is still light out, no need for flash lights here! 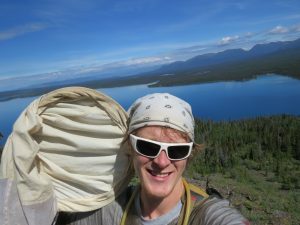 We have had some great sampling opportunities from hiking up Kings Throne, which looks over the beautiful Kathleen Lake, to going off-roading with a Parks Canada employee to the frog ponds in the Alsek River Valley trail where we did by far the best and most diverse aquatic sampling yet. We also made some great friends at our campground. We got quite lucky and had some super friendly neighbours who invited us for a BBQ, it was great! On top of King’s Throne with a beautiful view. The hike up to what is known as Kings Throne, which is a plateau about ¾ up a mountain, was absolutely amazing. The view the entire hike was breathtaking, and as I mentioned before we had a great view of Kathleen Lake. We collected insects along the entire path leading to the Kings Throne which had an elevation of 1200m. We even met a family at the top and got to talk to them about our project and they were very interested in some of our collection methods. They also had a good laugh once they saw us using our aspirators. We found a lot of spiders as we flipped rocks on the mountainside. We also found butterflies and a variety of bees and wasps the entire way up. Once we reached the “throne” we did some sweep netting and to our surprise we collected the largest mass of insects we have seen yet from this method of collection. I was amazed to see the biomass of flies and beetles when the landscape seemed to be so rocky and bare when compared to lower elevations where we had been doing most of our collecting. I seemed to have hit a sweet spot near the throne where I found a valley, which had a great variety of vegetation that I had commonly seen at lower elevations. With just about a minute of sweeping I had completely filled the container on my aspirator, giving us lots of work later on when it comes to sorting. After the hike we decided to go for a swim in Kathleen Lake, which is fed by glacier run off, so yes it was very cold. On my way out of the water I saw some little critters scuttling along the rocks. I took a closer look and noticed that there was little Sculpins all over the place. I was able to grab one with my hands and snap a few pictures before returning to back in to water. I was actually surprised I could catch these little fish with my hands; I am guessing the water is so cold they are just somewhat sluggish. At the frog ponds with Parks Canada staff member Mat. We also had some great outreach days at a rather remote visitor center, Tachal Dhal, but we still met a lot of people, over 45 people at each event. This visitor center had a great viewing pad where one can look to a nearby mountain side and try and spot out the elusive mountain dwelling Dall Sheep. We were lucky to see a rather large herd on one of the last days we visited Tachal Dhal. Sculpin I found in Kathleen Lake. Lastly I wanted to touch on our glacier flight. For our day off we decided to go for a flight with our friends from Icefield Discovery Flightseeing. I can’t put what I have seen into words, it was breathtaking. We had plans to make a glacier landing to take some pictures, even do a little collecting with the nets and take a snow sample to see what critters may be lurking within. However Mother Nature would not allow this, as the glacier landing site was completely under cloud cover, which results in unsafe landing conditions. So alternatively we still did a glacier flight minus the landing, but it was still awesome. There was just so much to see it was hard to take it all in on our hour flight, it only felt like ten minutes. I would just also like to thank all the friendly Kluane park staff that made us feel very welcome and kept us company, on these long bright northern nights. Hello again readers, it’s me, Martin the BIObus crew member. Remember how last time I talked about Smithers? Well this time I’m going to give a rundown of what we’ve been doing since then like the drive up to the Yukon and our little visit to Whitehorse and a bit about bear safety. 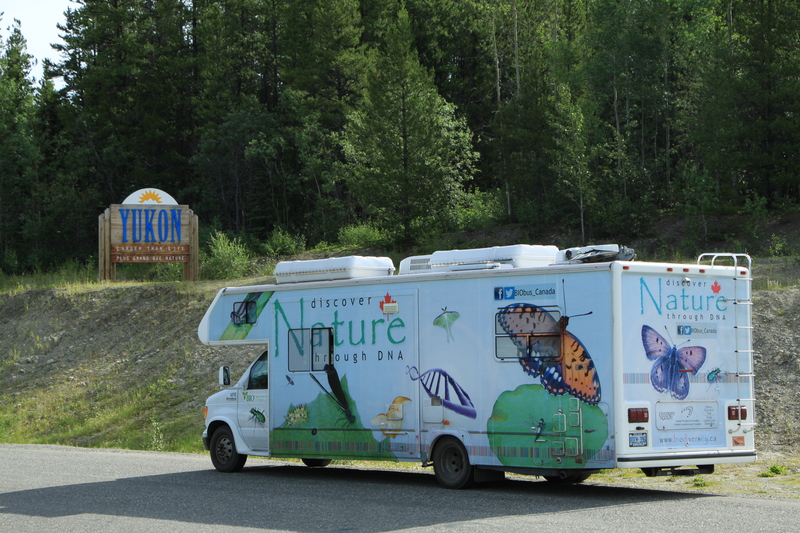 The BIObus is just about to cross the border into the Yukon. 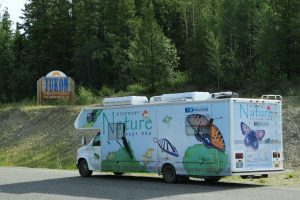 We left Tyhee Lake Provincial Park Campground on the twelfth of July and started our adventure north on the Trans Canada Highway towards the Yukon. Along the way we made a quick stop in Moricetown to watch fishermen catch salmon in the river there. It was spectacular to see the fishermen hang from the rocks near the water’s edge and simply place their nets in the water and catch salmon swimming upstream. We didn’t stick around for too long, we had a schedule to keep. If we were going to get to Kluane National Park within two days we needed to get moving. Our ride North was nothing short of remarkable with mountains surrounding us for most of the ride there, beautiful rivers and grand cliff side views. Along our way we saw tonnes of birds and lots of animals. We stopped that night at a rest stop just before we hit the border of the Yukon and British Columbia. After a long night of battling mosquitoes we left in a hurry to get out of the mosquito infested rest area. In less than an hour we were at the border. Once we made it to the Alaska Highway we speedily made our way North to Whitehorse to meet Carmen, Kluane’s park ecologist. She gave us a rundown of what we should expect of Kluane and where she recommends we should set up our insect traps. She also gave us some recommendation on bear safety. It was a well needed break from driving for the past seven plus hours but there was no time to relax we still needed to drive to Haines Junction which is another two hours away! We made it to our campsite just in time to have dinner and go to sleep. The next morning we headed out to the Kluane visitors center to check out a bear safety video that was being screened just for us. The video was very informative, we learnt how to avoid bears and how to deal with coming across them in the field. 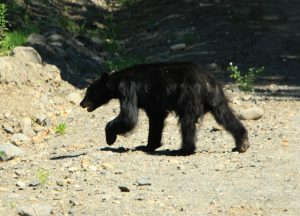 A bear happily trailing along the side of the road. While working in bear country there are a few things to always keep in mind. Firstly, bears are wild animals, and should be treated as such and no matter how cute that little grizzly bear cub looks you should never ever approach a bear. 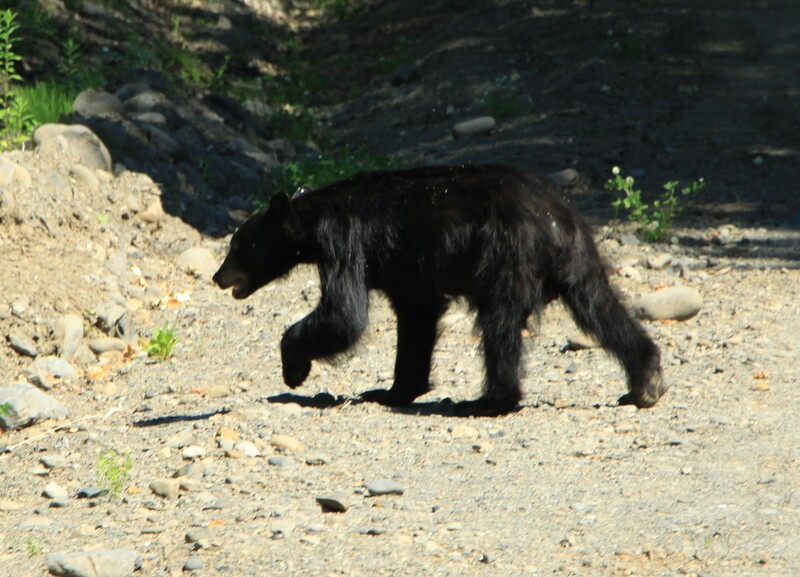 Secondly, bears are more afraid of us than we are of them, you should always carry bear spray, bear bells and walk in groups and have loud conversations so that if there are any bears in the area they can hear you first and scamper away. Thirdly, you should never surprise a bear, if you are being careful this shouldn’t be a problem but if not, bears can act in a variety of different ways and a few of those ways could end badly for either party. We were told that bears can be shy, curious, defensive, or aggressive and each mood has a different protocol to follow. A shy bear will flee an area as soon as it catches a hint of a human presence so these bears are not very dangerous. A curious bear may be interested in the food wrappers you leave behind or the sounds of footsteps with no voices, these bears can be avoided by keeping the trails clean and being loud, bears know what’s good for them and will avoid people. A defensive bear will stand its ground, it may even advance on you, the best way to deal with these bears is to make lots of noise, raise your voice at the bear and show it that you are ready to fight if it comes to it, and get your bear spray ready. Start moving backwards from the bear, if it follows you stand your ground again and make yourself look as big as possible. Once you are safely far enough away from the bear go back the way you came and head for the trail exit. If the bear does not stop his advance drop to the ground, lay on the ground face down and put your hand over your head, this will protect your face and vital organs. Lastly, an aggressive bear is the most dangerous, it may even believe you are food, this can be noted by the way the bear advances in your direction with its eyes fixed on you. In this case do the same as before but this time fight for your life because this time the bear is going for a kill! As you could imagine, this information really riled us up and so we’ve taken extra precautions and even come up with a few songs to sing along the paths. Each of us carries bear spray and a set of bear bells, luckily the only bears we’ve seen are on the side of the road just lounging happily in the sun. 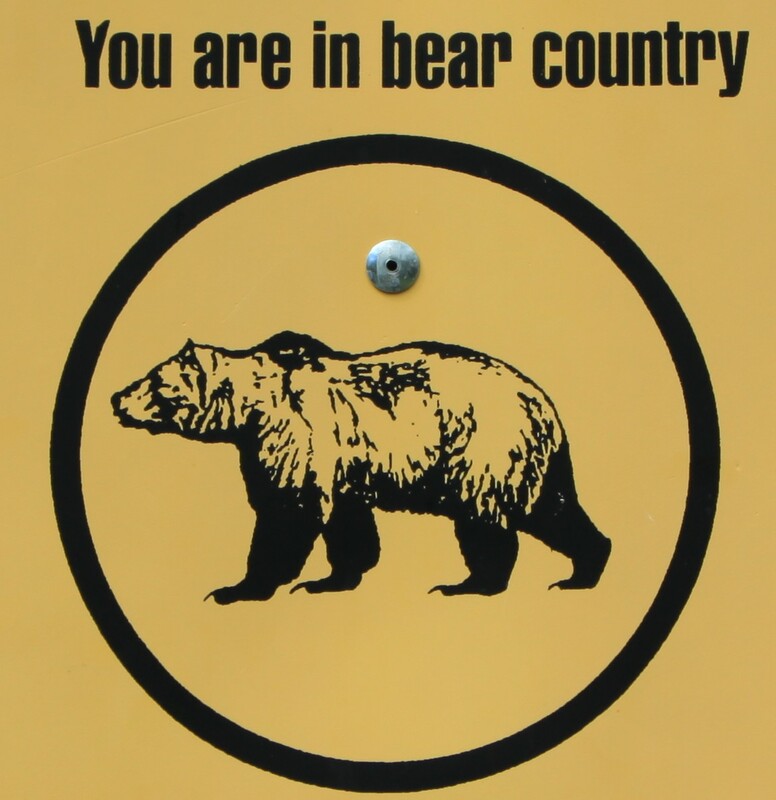 The sign leading in to bear country, a cute way of saying BEWARE OF BEARS!